A group of horny teenagers accidentally discover a gang of mutated hellbeasts living under the Golden Gate Bridge, each with its unique theme (samurai, archer, soldier, ape-guy, etc.) and way of killing people. The Neon Maniacs start hunting down Natalie (Leilani Sarelle) and her friends. The cops won’t listen, and obviously the only rational thing to do is set a trap at a nearby battle of the bands using the Neon Maniacs’ only weakness… water. Story-wise, Neon Maniacs is pretty standard stuff: Monsters stalk and kill teenagers in various states of undress. There’s a survivor girl and maybe two other people who aren’t complete idiots. They outwit the monsters and kill them (or did they?...dun dun dun). However, in the details, Neon Maniacs is pretty weird. 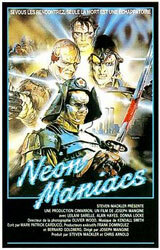 The Neon Maniacs have their own trading cards, which they conveniently leave in front of the door where they live. Who are they? What do they want? Why is one guy an ape and another a soldier with a machine gun? If water can kill them, why do they live under a bridge? Since it was filmed in the 80’s this film is required by law to contain hair metal, a synthesizer score, and slime. A typical monster mash draped in utter strangeness. I love that in the '80s, this felt standard. I definitely remember watching it as a kid and not questioning a single thing.